Interval cancers are cancers that are diagnosed during the interval between a negative screen and the subsequent screen. The rate of interval cancers is a performance indicator in the terms of reference of the Quebec Breast Cancer Screening Program (PQDCS). 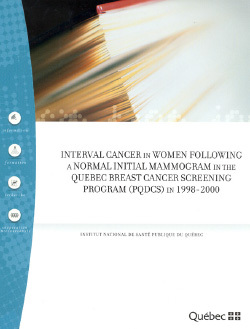 The PQDCS terms of reference do not set a standard for interval cancer rates, but the Evaluation Indicators Working Group, which monitors breast cancer screening programs in Canada, has determined that the rate of interval cancers should not exceed 6 cases of invasive cancer per 10,000 person-years within 12 months of a negative screen, or 12 cases per 10,000 person-years within 24 months of a negative screen. The primary objective of this analysis was to estimate the rate of interval cancers among women who received an initial mammography in the PQDCS in 1998-2000 and whose mammogram was interpreted as normal (including non-equivocal benign lesions). The analysis also sought to identify the characteristics of women, radiologists and facilities that are associated with rising or decreasing early interval cancer rates (≤ 12 months post-screen), late interval cancer rates (13-24 months post-screen), and detection rates. Finally, the study was designed to compare the clinical and pathological characteristics of the three cancer groups: early interval cancers (diagnosed ≤ 12 months post-screen), late interval cancers (diagnosed 13-24 months post-screen), and screening-detected cancers. The study looks at women who underwent screening mammography (referred to as the initial screening mammography) through the PQDCS between 1998 and 2000 and who signed a program consent form. Four groups of women were compared: screening-detected cancer; interval cancer diagnosed ≤ 12 months post-screen; interval cancer diagnosed 13-24 months post-screen; and controls. The “screening-detected cancer” group comprised all the women whose breast cancer (in situ or invasive) was detected at the time of their initial participation in the PQDCS between 1998 and 2000 (n=1,699). The “interval cancer” groups comprise all the women whose initial screening mammogram (1998-2000) was normal, but in whom breast cancer (in situ or invasive) was diagnosed in the post-screen period (n=165 ≤ 12 months post-screen; n=404, 13-24 months post-screen). The control group was selected from among the women whose initial screening mammogram was normal in 1998-2000 and who were not diagnosed with breast cancer during the post-screen period (n=48,200). Controls were randomly selected according to a ratio of 20 controls per case, with cases and controls matched on the basis of the quarter in which they were screened. Variables related to the characteristics of participants, radiologists and screening centres were derived from the PQDCS information system (SI-PQDCS). The data related to the clinical and pathological characteristics of cancer cases (both screening-detected and interval) were derived from pathology reports, the SI-PQDCS and the MedÉcho database. The data were analysed using logistic regression. In all of these analyses, odds ratio (OR) variances were corrected to account for intra-radiologist and intra-centre correlations in the interpretation of mammographic images. Among PQDCS participants who had a normal initial mammogram between 1998 and 2000, the rate of invasive interval cancer was 6.4 and 11.6 per 10,000 woman-years respectively during the 12- and 24-month periods following a normal mammogram finding. In terms of proportional incidence, these rates correspond to 23.3% and 42.0% of the invasive breast cancer incidence observed in Quebec in 1997, before the PQDCS began. The interval cancer rate tends to be higher among women with a higher risk of breast cancer, which means that rates of interval cancer increase with age and body mass index as well as with a family history of breast cancer or a history of breast biopsy. Breast density is strongly associated with the interval cancer rate. This link is particularly strong in the year following mammography screening. In the 12-month period post-screen, the odds ratio for interval cancer is 13.00 (confidence interval (CI) at 95%: 6.79-24.89) in women with > 75% breast density, compared to those with less than 25% density. This observation confirms that breast density, while being a risk factor for breast cancer, may also mask certain cancers during screening, as well as limit the sensitivity of mammography. Finally, the rate of interval cancer in the year following screening tends to decrease as a centre’s screening volume increases. The interval cancer rate in the 12-month period post-screen is 37% lower in centres that perform 4,000 screens or more per year than in centres that perform fewer than 2,000 screens per year (OR: 0.63, CI 95%: 0.37-1.06); χ2 trend: 3.70, p = 0.0546). In conclusion, the frequency of interval cancers in the PQDCS (1998-2000) is comparable to that observed in other screening programs and meets the requirements of the Evaluation Indicators Working Group. Moreover, breast density greatly limits the capacity of screening mammography to detect cancer. This link between high breast density and reduced mammographic sensitivity has been observed in other studies and now represents the consensus view. Studies now underway in the United States and Europe should, in the coming years, help to identify measures to improve screening performance for women with very dense breasts. Finally, increased screening centre volume is linked to a higher detection rate and a lower interval cancer rate in the first year post-screen. These observations suggest that screening sensitivity increases with screening centre volume. It is important to understand the reasons behind this link, so that all centres can benefit from the advantages offered by centres with a higher screening volume.